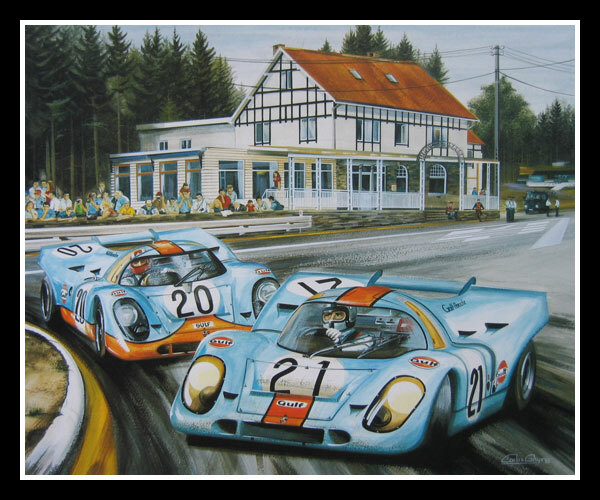 The eventual winning John Wyer / Gulf Porsche 917 of Rodriguez / Oliver, leading home its sister car driven by Siffert / Bell, powerslides through the ‘La Source’ hairpin during the record breaking 1000 kms race of Spa-Francorchamps in May 1971. There was something ironic in the fact that both Mexican Pedro Rodriguez and Swiss Joseph Siffert should lose their lives towards the end of an era of Sports Car racing that they had immeasurably enriched by their flair and exciting driving. With the passing of these two great drivers and the demise of the Porsche 917 as a Championship sports car at the end of 1971, the chapter was closed on an important and thrilling part of Motor Racing. 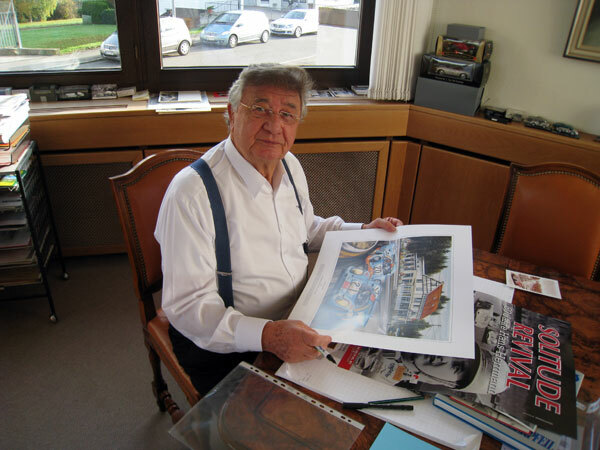 Former Porsche factory driver and 1970 Le Mans winner HANS HERRMANN, signing a limited edition print of my painting.